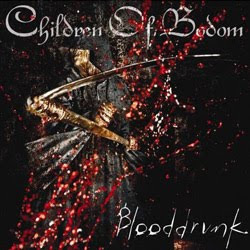 There is the unmistakable stench of borrowed ideas mixed with lazy drift on Blooddrunk, the 6th studio album from Finland's Children Of Bodom. After the brilliant Are You Dead Yet? (2005), the band appears to have hit a pretty solid wall. You have to be really worried when one of the freshest sounding tracks on the CD is the cover of Ghost Riders In The Sky, from way back in 1949. Almost every Alexi Laiho riff that's worth listening to on Blooddrunk appears to be lifted from previous entries in the band's catalogue, and the riffs that don't sound familiar are fractured, rushed, and simply unmemorable. Janne Wirman's keyboards are equally uninspired, and the overall level of energy and song composition is just lacking. The CD offers up one classic song that is worthy of the Bodom name: Banned From Heaven delivers an epic mid-tempo melody that proceeds with a strong sense of purpose and reminds us what the band may still be capable of. In other words, Banned from Heaven deserves to be on almost any other Bodom CD except this one. Otherwise the songs stumble through and are typically not much better than middling. Lobodomy sets a low in pure inane irritation. Children Of Bodom's next CD needs to be a strong and sober comeback statement, otherwise we could be witnessing the quick demise of a once proud institution. Recorded, Produced and Mixed by Mikko Karmila.